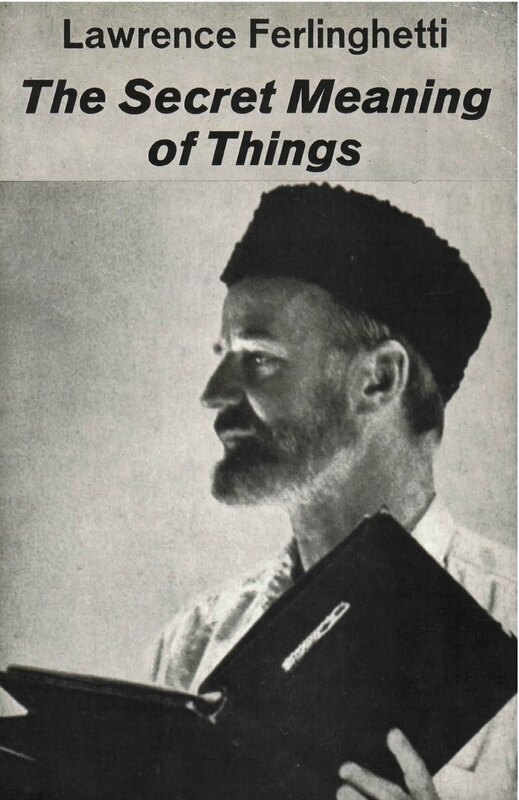 The Secret Meaning of Things is Lawrence Ferlinghetti’s fourth book of poems, and it has all the elements of his earlier poetry: lyrical intensity, wit, social concern, satirical bite, and above all a classical claritas. But it goes much further: there is a deepening of vision and a darker understanding of “our clay condition.” The six long poems in The Secret Meaning of Things show a progressive continuity and clarity of perception that apprehends both the hard reality and luminous irreality in everyday phenomena. In “Assassination Raga”––on the death of Robert Kennedy––the glass through which the poet sees darkly is the television screen; the poem was first read on the night of RFK’s funeral at a mass memorial in San Francisco. “Bickford’s Buddha” is a meditation on “Observation Fever” in Harvard Square, while “All Too Clearly” finds a “touch of old surrealism/at a stoplight in La Jolla.” “Through the Looking Glass” begins with an actual flight aboard a commercial airliner and moves through a psychedelic vision to a final flash of the Dance of Shiva, which in turn opens out into the worldview of “After the Cries of Birds.” “Moscow in the Wilderness, Segovia in the Snow” comes out of Ferlinghetti’s travels to Moscow and across the steppes in the winter of 1967.